The heartworm is a long slender worm that passes in a larval stage from mosquitoes to your dog. The larvae enter the blood stream and wind up in the heart, where they continue to develop. Their life cycle is pretty complicated, because they can't grow into adults until they are ingested by a second mosquito, where they molt and get re-deposited into another (or even the same) dog. The blood contains microscopic heartworm babies (who are NOT cute). Once inside the dog, the not-cute baby heartworms can grow into truly hideous adults over a foot long. The disease causes serious irreversible damage to the heart, the lungs, and the arteries feeding them. Over 244,000 dogs test positive for heartworm infection each year. Heartworm is present over most of the United States. Wherever there are mosquitoes, there can be heartworm. This disease is no longer confined to areas that are warm all year round. The creatures live inside the pulmonary arteries and begin to damage them within days. The arteries dilate and begin to turn, resulting in aneurysm and blood clots. Blood must be shunted to other, worm-free arteries, while fluid accumulates in lungs around the wormy arteries. Blood that does reach the lung is not sufficiently oxygenated. The dog starts to cough and becomes unable to participate in strenuous physical activity. You may even see nosebleeds or pneumonia. Another heart problem caused by heartworm is called caval syndrome, in which the entire right side of the heart becomes filled with worms that then begin to back into the large veins feeding that side of the heart. Collapse, shock and sudden death may result. Believe us, this is something you don't want your dog to have. The only way to tell if your dog has heartworm is for him to be checked by a vet. He can perform a simple blood test for heartworm, which will detect the presence of the worm before any symptoms appear. The treatment for established heartworm is arduous for the dog (it is actually a form of arsenic) and expensive for you; however, it's great to know that this terrible disease can be easily and safely prevented. 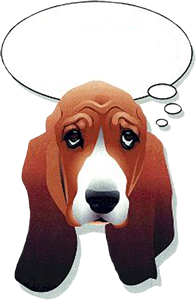 Heartworm prevention should be started by the time your dog is 12 weeks old. A once-a-month prescription tablet or topical treatment will do the trick. There's even a once-every-six-month injection. For added benefit, most heartworm preventives also prevent intestinal parasites or even fleas. Many products are available -- but please use something. Check with your vet to see what plan is right for your dog. Insist that your dog be on this important medicine all year round. Whatever you choose, however, it's important that the dog be tested for heartworm before putting him on a preventive. The medication causes the death of any heartworms that happen to be in the body, and if a dog has a large number of worms, their dead bodies could clog his arteries and kill the dog. Your dog depends on you for his care. Don't disappoint him.